Gaining employment is a goal for many students. In the workplace, there are various social situations that require insightful responses from employees. 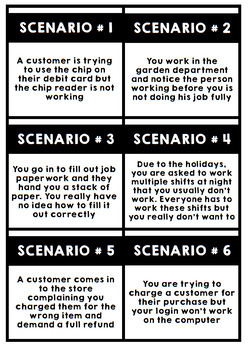 For students with disabilities, these scenarios can be very tricky to successfully overcome. I have created these task cards to hopefully fill a void - I know I needed something for my students to practice role playing conversations in a structured but realistic and fun way. With this download, you will get the workplace social skills practice you are looking for!! This task cards offer a realistic and versatile approach to workplace conversations using a variety of scenarios your students might encounter while working. Reacting appropriately to these prompts can serve to build invaluable soft skills that can result in long-term employment success! Are you Interested in the JENGA version of this download? CLICK HERE to view it! I print these cards out on a variety of bright paper. I choose to laminate them to aid in their longevity, but using them just as paper is fine too! Depending on the year and the types of students I have, I do whole group discussions and then break into smaller groups for more individualized attention. You will notice the discussions that follow these prompts will provide you with honest feedback and insight on how students' minds work during these often unique and stressful situations. With proper guidance and support, these task cards are great to review social concepts that can often be difficult to replicate in a classroom environment. Need Other Communication Skills Lessons? Workplace Skills, Unit One: Click Here! Workplace Skills, Unit Two: Click Here! 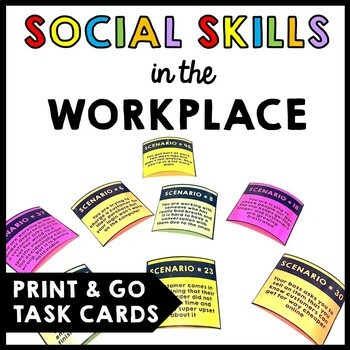 Workplace Social Skills Prompts, Task Cards: Click Here! Want All Four? Get the Bundle: Click Here! Workplace Social Skills Prompts, Jenga: Click Here! Interested in Other Work Themed Downloads? Job Interest Inventory: Click Here! 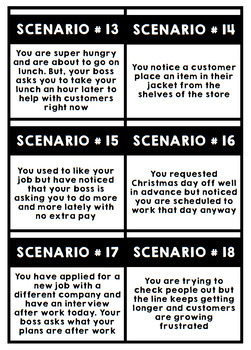 Reading Work Schedules: Click Here! Understanding Gross Versus Net Pay: - Click Here! Work Place Conversations 1: Click Here! Workplace Conversations 2: Click Here! 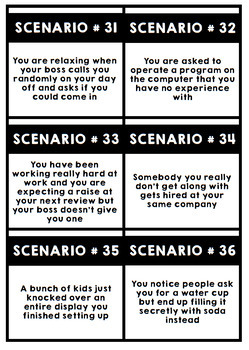 Workplace Social Skills, Task Cards: Click Here! Vocational Vocabulary Words: - Click Here! Need Other Popular Life Skills Lessons? Coupons, Reading Emphasis: Click Here! Hours of Operation: Click Here! Safety Signs, Community Signs: Click Here! Dollar Up, 1s, 5s, and 10s: Click Here! How to Use a Microwave:Click Here! How to Use a Stove:Click Here! How to Use an Oven:Click Here! Generic vs. Name Brand:Click Here! To follow my store simply click on “follow me” under Life Skills Creations on the top of my store page. You will be one of the first people to know when I have a sale or post new Life Skills Freebies in my store. Leave Feedback and Earn Credits!